Thanks to the unique BOOSTER Pro technology, the new generation ingredient SYN-COLL, along with vitamins A, C, and E provide constant rejuvenation to your skin, making it firm and smooth. The exclusive complex increases the natural production of collagen in the skin and stimulates the production of new skin cells, thus granting your skin a younger and firmer appearance. The high concentration of hyaluronic acid in the product, combined with elastin, makes the skin feel more vital than ever. • From the very first use you will note an improvement in the texture and elasticity of your skin. • After a month’s use your skin will look firmer and more radiant. Anti Wrinkle & Skin tightenerThis eye serum instantly increases elasticity of the skin, smoothing lines and wrinkles around eyes. The serum tightens skin under the eyes and lifts sagging eyebrows and eyelids. Your skin texture will feel silky-young and smooth. Directions: Apply around the eyes. A little of this highly-concentrated serum goes a long way. Massage gently until absorbed. Use morning and evening. This kit includes a unique mix of 3 luxurious cleansing Booster Pro products.We would like to ensure that your skin is perfectly clean & healthy.This kit includes:Facescrub A unique formula that provides deep cleaning of the facial skin without harming the skin’s elasticity and natural moisture levels. The cleanser combines peach grains and retinol to remove dead skin cells and create smooth skin with unified texture.Facial SoapA unique foaming gel that cleanses and moisturizes the face skin. Enriched with retinol, aloe vera, jojaba oil that help maintain healthy moisture levels in the skin, promote soothing and healing of irritated or damaged skin tissue and protect the skin against pollutants.SkintonerBooster Pro Premium skin toner removes excess facial oil, dirt and impurities from the skin and clears clogged skin pores. Specially formulated with Aloe vera leaf, plant extracts and age-defying ingredients. 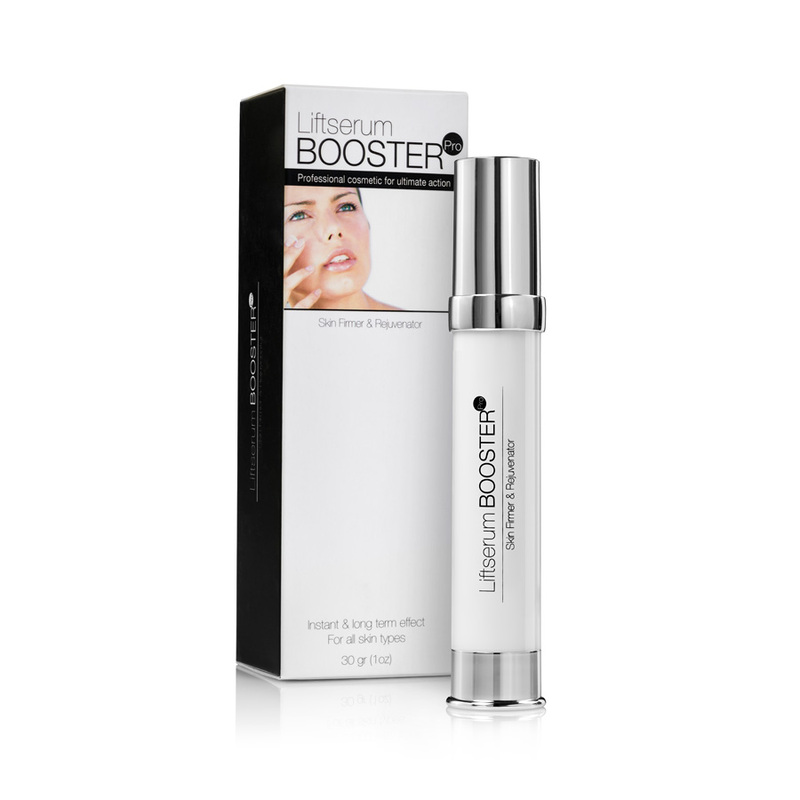 Booster brings you an innovative technology that works on your hand skin24 hours a day. Enriched with retinol and hyaluronic acid from the Booster Hand Cream absorbs quickly, protecting your hands from dryness and keeping the skin soft and silky. With Apricot Grains15 grThe ultimate facial peeling soap of BOOSTER Pro contains apricot granules for deep cleansing and skin renewal. Shea butter, rosehip and borage oil that moisturize the skin with anti-aging effect , especially formulized for dry skin.Directions: Apply daily to faceand rinse with warm water. The unique blend of natural oils, including rosehip oil and evening primrose oil, known as powerful anti-oxidants, together with the dead sea salt in the product, help remove dead skin cells while stimulating production of new cells and improving the skin's texture. The body scrub combines invigorating ingredients that help renew the skin cells , making your body feel vital, rejuvenated and heavenly scented. • From the very first use you will note an improvement in the skin's texture and a feeling of vitality.• After a month's use your skin will look smoother and more radiant. Booster Pro Nail Kit - Hand cream that works on your hand skin 24 hours a day enriched with retinol and hyaluronic acid.Cuticle oil to avoid cracking and dry cuticles.Nail file to reach desired nail shape and a Buffer to stimulate blood circulation.- For healthy and good looking hands & nails. The ultimate facial peeling soap of BOOSTER Pro contains Peach granule for deep cleansing and skin renewal. The Shea butter, Olive oil and jojoba oil vitalize and moisturize your skin deeply.Directions: Apply daily to face, and rinse with warm water. With Jojoba GrainsBooster Pro Jojoba Peeling Soap contains Jojoba Grains which stimulatesmetabolism and blood circulation by penetrating the pores of the skin tohelp oily face balance. The soap formulated with olive oil shea butter, Aloe Vera and tea tree oil for moisturizing and skin calming.Directions: Apply daily to face and rinse with warm water.